Mission Therapeutics has built a world-leading proprietary DUB platform for the discovery and development of first-in-class drugs that selectively target specific disease-associated DUBs. As DUBs are a large family of proteins expressed in many different human cells and with many links to human disease, they have attracted much interest as drug targets. Nevertheless, the development of potent DUB inhibitors suitable for clinical development initially proved challenging due to issues linked to specificity and selectivity. Since Mission’s foundation, our scientists have been focused solely on the biology of DUBs and the development of specific and highly potent small molecule drugs that inhibit the activity of specific DUB targets. We believe that our singular focus on this area has enabled us to solve many of the previous issues that have made the development of DUB drugs challenging. Mission has developed a novel broad chemistry platform that enables the generation of selective, potent inhibitors of individual DUBs. The application of this DUB platform has resulted in the development of a rich pipeline of DUB inhibitor programs that are progressing towards clinical development, preferentially together with patient selection strategies. Mission has designed and developed rigorous target identification screening and validation cascades to ensure our efforts are focused on selectively and specifically inhibiting the right DUBs. We are systematically screening against individual DUBs in areas of unprecedented, novel biology and pathology with significant commercial potential. We use patient selection strategies to enable early proof- of-concept in indications with high unmet medical need. 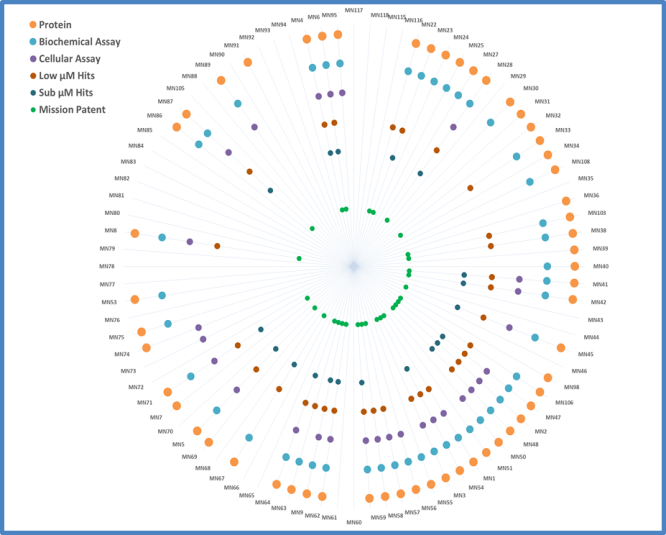 Mission has developed a robust screening cascade, designed to eliminate false positives as early as possible and focus on genuine drug candidate hits from the outset. 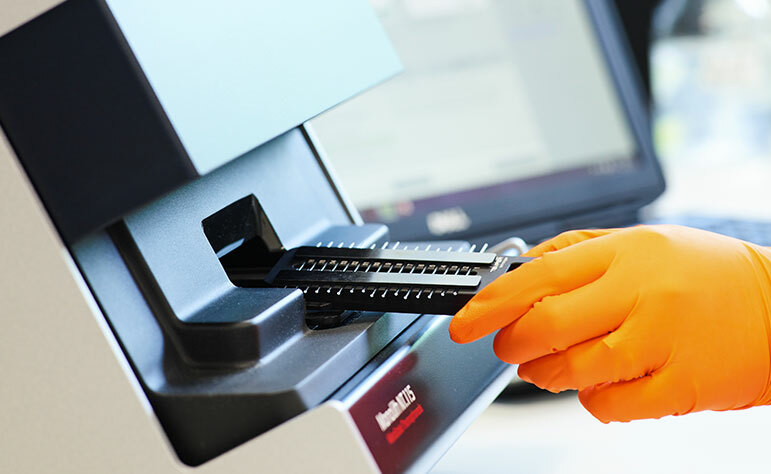 We develop and use bespoke biochemical and cellular assays that are as closely related as possible to physiological conditions. This involves purifying full-length DUBs from mammalian cells to ensure proper folding, post-translational modifications and co-factors, as well as using substrates closely related to the natural DUB substrates, such as incorporating an isopeptide linkage between ubiquitin and, ideally, a peptide derived from the DUB’s cellular target. 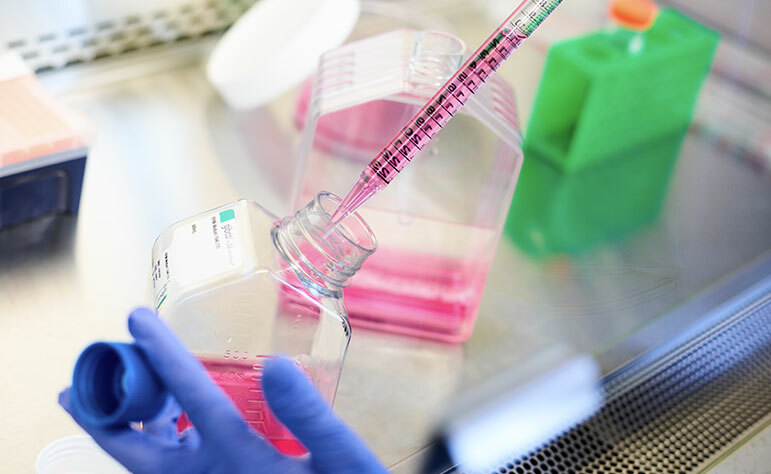 A number of orthogonal, confirmatory assays are also used to eliminate false positives at an early stage and our proprietary, cellular target engagement assays are performed as early as possible to confirm specific inhibition of DUBs in cells. 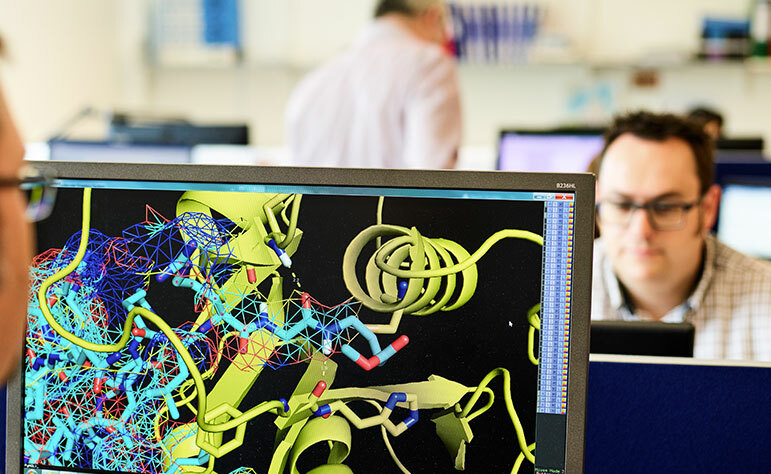 The drug discovery cascade is accelerated by iterative design-make-test cycles, driven by our in-house medicinal chemistry team, and guided by molecular modelling and structural biology. Using a novel approach, our in-house medicinal chemistry team developed a DUB-specific compound library consisting of molecules with exclusive and proprietary chemotypes. All of the compounds are drug-like, contain no toxicophores and fully comply with the ‘rule of 5’ criteria. This proprietary library asset has seeded many of our DUB therapeutic projects. It has a high hit rate, enabling rapid progress in the identification of optimised leads with candidate drug levels of potency, selectivity, pharmacokinetics and in vivo efficacy. Our core chemistry platform is tuneable, and we have developed novel chemistries for DUB-targeted therapeutics. These modified chemistries are specifically designed to enhance target selectivity and drug potency, enabling generation of specific inhibitors against individual DUBs. Clinical development and patient selection strategies are central to all of Mission’s programs. 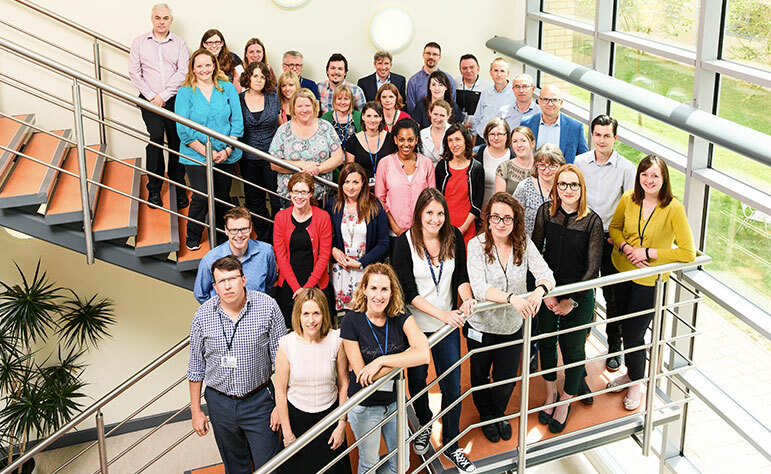 These are overseen by our VP of Clinical Development, Paul Thompson, who is supported and guided by experienced, international clinical advisors. For our programs, a patient selection and/or biomarker strategy will be incorporated as early as possible to increase the chances of obtaining early proof of clinical signs of activity. We also collaborate with clinical consulting companies at various stages of the discovery and development process to ensure our programs are aimed at viable markets in areas of unmet clinical need. 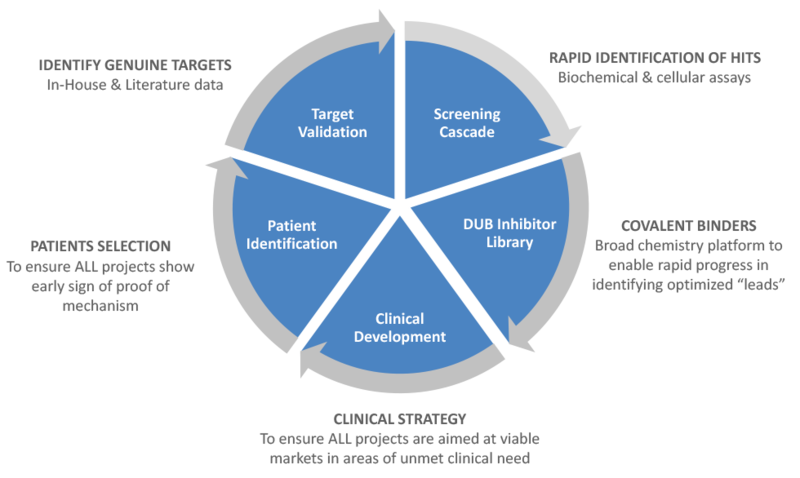 Mission is protecting its platform and pipeline with many patent filings covering target validation, proprietary assay development, composition-of-matter and patient selection/biomarker strategies. Agarwal A, Dong Z, Harris R, Murray P, Parikh SM, Rosner MH, Kellum JA, Ronco C; Cellular and Molecular Mechanisms of AKI. Acute Dialysis Quality Initiative XIII Working Group. J Am Soc Nephrol. 2016 May;27(5):1288-99. Benassi, B., Marani, M., Loda, M. and Blandino, G. (2013). USP2a alters chemotherapeutic response by modulating redox. Cell Death and Disease, 4(9), p.e812. Bingol, B., Tea, J., Phu, L., Reichelt, M., Bakalarski, C., Song, Q., Foreman, O., Kirkpatrick, D. and Sheng, M. (2014). The mitochondrial deubiquitinase USP30 opposes parkin-mediated mitophagy. Nature 510: p370, 2014. Clague, M., Barsukov, I., Coulson, J., Liu, H., Rigden, D. and Urbe, S. (2013). Deubiquitylases From Genes to Organism. Physiological Reviews, 93(3), pp.1289-1315. Fraile, J., Quesada, V., Rodríguez, D., Freije, J. and López-Otín, C. (2011). Deubiquitinases in cancer: new functions and therapeutic options. Oncogene, 31(19), pp.2373-2388. García-Santisteban, I., Peters, G., Giovannetti, E. and Rodríguez, J. (2013). USP1 deubiquitinase: cellular functions, regulatory mechanisms and emerging potential as target in cancer therapy. Molecular Cancer, 12(1), p.91. Hussain, S., Foreman, O., Perkins, S., Witzig, T., Miles, R., van Deursen, J. and Galardy, P. (2010). The de-ubiquitinase UCH-L1 is an oncogene that drives the development of lymphoma in vivo by deregulating PHLPP1 and Akt signaling. Leukemia, 24(9), pp.1641-1655. Kon, N., Kobayashi, Y., Li, M., Brooks, C., Ludwig, T. and Gu, W. (2009). Inactivation of HAUSP in vivo modulates p53 function. Oncogene, 29(9), pp.1270-1279. Liang, J., Martinez, A., Lane, J., Mayor, U., Clague, M. and Urbe, S. (2015). USP30 deubiquitylates mitochondrial Parkin substrates and restricts apoptotic cell death. EMBO reports, 16(5), pp.618-627. Nicholson, B. and Suresh Kumar, K. (2011). The Multifaceted Roles of USP7: New Therapeutic Opportunities. Cell Biochemistry and Biophysics, 60(1-2), pp.61-68. Oliveira, A. (2012). The TRE17/USP6 Oncogene: a riddle wrapped in a mystery inside an enigma. Frontiers in Bioscience, S4(1), p.321. Pearl, L., Schierz, A., Ward, S., Al-Lazikani, B. and Pearl, F. (2015). Therapeutic opportunities within the DNA damage response. Nature Reviews Cancer, 15(3), pp.166-180. Song, M., Salmena, L., Carracedo, A., Egia, A., Lo-Coco, F., Teruya-Feldstein, J. and Pandolfi, P. (2008). The deubiquitinylation and localization of PTEN are regulated by a HAUSP–PML network. Nature, 455(7214), pp.813-817. Trotman, L., Wang, X., Alimonti, A., Chen, Z., Teruya-Feldstein, J., Yang, H., Pavletich, N., Carver, B., Cordon-Cardo, C., Erdjument-Bromage, H., Tempst, P., Chi, S., Kim, H., Misteli, T., Jiang, X. and Pandolfi, P. (2007). Ubiquitination Regulates PTEN Nuclear Import and Tumor Suppression. Cell, 128(1), pp.141-156. van Loosdregt, J., Fleskens, V., Fu, J., Brenkman, A., Bekker, C., Pals, C., Meerding, J., Berkers, C., Barbi, J., Gröne, A., Sijts, A., Maurice, M., Kalkhoven, E., Prakken, B., Ovaa, H., Pan, F., Zaiss, D. and Coffer, P. (2013). Stabilization of the Transcription Factor Foxp3 by the Deubiquitinase USP7 Increases Treg-Cell-Suppressive Capacity. Immunity, 39(2), pp.259-271. Vendrell, J., Ghayad, S., Ben-Larbi, S., Dumontet, C., Mechti, N. and Cohen, P. (2007). A20/TNFAIP3, a new estrogen-regulated gene that confers tamoxifen resistance in breast cancer cells. Oncogene, 26(32), pp.4656-4667. Williams, S., Maecker, H., French, D., Liu, J., Gregg, A., Silverstein, L., Cao, T., Carano, R. and Dixit, V. (2011). USP1 Deubiquitinates ID Proteins to Preserve a Mesenchymal Stem Cell Program in Osteosarcoma. Cell, 146(6), pp.918-930. Wiltshire, T., Lovejoy, C., Wang, T., Xia, F., O’Connor, M. and Cortez, D. (2010). Sensitivity to Poly(ADP-ribose) Polymerase (PARP) Inhibition Identifies Ubiquitin-specific Peptidase 11 (USP11) as a Regulator of DNA Double-strand Break Repair. Journal of Biological Chemistry, 285(19), pp.14565-14571.